Scientists and nonscientists alike have a similar response to cosmic ancestry. They do not object, "That's impossible! Life couldn't survive in space...." Instead, almost unanimously, they say, "What difference does it make if life on Earth came from space? I want to know how life began in the first place." Russian theorist A. I. Oparin rejected panspermia in 1924, because "the theory of panspermia is only the answer to the problem of the origin of Earthly life, and not in any way to that of life in general" (2). A recent variant of this reaction comes from Nobel laureate Christian de Duve, who writes, "...even if we accept that life came to Earth from outer space, we are still left with the problem of how it originated. I shall, therefore, assume that life was born right where it actually is: here on Earth" (3). "How did life begin in the first place?" sounds like a perfectly good question. Wouldn't anyone like to know the answer to that question? But to be scientific, first we should examine the question. Perhaps the most important step in science is asking the right question. It is detrimental if a question contains unwarranted assumptions. For example, "What body is Earth resting on?" is not a fruitful question. It contains a false (though understandable) assumption. Similarly, the question "How did life begin in the first place?" contains an assumption that we should scrutinize — that life had a specific beginning in a first place. The related question, "How did life on Earth begin?" assumes only what we know very well. There was a time when life on Earth couldn't have existed. Before four billion years ago, Earth was too hot. Before 4.6 billion years ago, Earth didn't exist; it was still forming. Life on Earth had to have a beginning. Life in general — life in the universe — is another, and a quite different, question. If the question that scientists pose for themselves is simply too difficult, they are limited to pure conjecture. For example, in the Middle Ages, how Earth was formed was a question scientists could only guess about. Other knowledge was needed before tackling that one. In practice, most scientific knowledge is accumulated in small steps. Today, if we were able to answer the limited question "How did life on Earth begin?" it would be a rather large small step, wouldn't it? If we figure out that one, we probably deserve a vacation before attacking the next problem. Yet many scientists continue to assert that the question is how life began in the first place. They say that knowing life on Earth comes from space would be of only minor interest because it sheds no light on the question. This position is detrimental to science. Actually, it is dumbfounding. If one had to compose the question for all of science, it should be something like "What's going on?" Isn't that what we really want to know? (3.5) With that attitude, it is fruitful to ask more and more precise questions. But if we continue to insist that the question about life is "How did life begin in the first place? ", we establish groundrules that may keep us from learning what's going on. Even if we never find out how life begins in the first place, it makes a lot of difference where life on Earth comes from. If life comes from space, evolution could work completely differently from the way we were taught in school. New genes could come from space throughout life's history, even today. These arrivals could be the source of evolution's raw material — new genetic programs for evolution to sift through, as discussed in the webpages grouped under "How Does Life Evolve?" This makes a pretty big difference in our understanding of what's going on. Under the old theory we are completely isolated from the greater universe, including other life in it, if there is any. But if life comes from space, life is probably abundant in the universe and we on Earth are related to it. This change has profound philosophical and psychological consequences. This makes a really big difference, as we will discuss. Neo-Darwinism is discouraging. In the preface to Back to Methuselah, George Bernard Shaw writes, in 1921, "But when its whole significance dawns on you, your heart sinks into a heap of sand within you. There is a hideous fatalism about it, a ghastly and damnable reduction of beauty and intelligence, of strength and purpose, of honor and aspiration...." He didn't like it. We would like to think of ourselves as necessary, inevitable, ordained from all eternity. All religions, nearly all philosophies, and even a part of science testify to the unwearying, heroic effort of mankind desperately denying his own contingency. ...The universe was not pregnant with life nor the biosphere with man. Our number came up in the Monte Carlo game. Is it any wonder if, like the person who has just made a million at the casino, we feel strange and a little unreal? ... then man must at last wake out of his millenary dream; and in doing so wake to his total solitude, his fundamental isolation. Now does he at last realize that, like a gypsy, he lives at the boundary of an alien world. A world that is deaf to his music, just as indifferent to his hopes as to his suffering or his crimes. ... If it is true, as I believe, that the fear of solitude and the need for a complete and binding explanation are inborn—that this heritage from the remote past is not only cultural but probably genetic too—can one imagine such an ethics as this, austere, abstract, proud, calming that fear, satisfying that need? I do not know. The ancient covenant is in pieces; man knows at last that he is alone in the universe's unfeeling immensity, out of which he emerged only by chance. His destiny is nowhere spelled out, nor his duty. Even more purposeless, more void of meaning, is the world which science presents for our belief. Amid such a world, if anywhere, our ideals henceforward must find a home. That man is the product of causes which had no prevision of the end they were achieving; that his origin, his growth, his fears, his loves and his beliefs, are but the outcome of accidental collocations of atoms; that no fire, no heroism, no intensity of thought and feeling, can preserve an individual life beyond the grave; that all the labors of the ages, all the devotion, all the inspiration, all the noonday brightness of human genius, are destined to extinction in the vast death of the solar system, and the whole temper of Man's achievement must inevitably be buried beneath the debris of a universe in ruins—all these things, if not quite beyond dispute, are yet so nearly certain that no philosophy which rejects them can hope to stand. Only within the scaffolding of these truths, only on the firm foundation of unyielding despair, can the soul's habitation henceforth be safely built. Here we are in this wholly fantastic Universe with scarcely a clue as to whether our existence has any real significance. No wonder then that many people feel the need for some belief that gives them some sense of security, and no wonder that they become angry with people like me who say that this security is illusory. But I do not like the situation any better than they do. Without cosmic ancestry, the details of biology inspire only indifference in most people. In biology class the student may well wonder, "What difference does it make?" Only a few writers, like Lewis Thomas, are able to infuse wonder, not clinical indifference, into biology. Thomas expressed an admirable sense of wonder about mitochondria, termites, the sense of smell, and words. He knew that the convoluted symbiotic life cycle of the oncideres beetle could hardly evolve by chance alone (8). His attitude was, we don't know everything so we should probably be reverent. Cosmic ancestry restores enchantment to nature. No longer is biology the result of meaningless accidents. Now we realize that life on Earth is related to life throughout the universe. Biology has universal principles. Now one can genuinely enjoy studying the anatomy of a dead beetle or a living horse. Now the barely comprehended nanoscale technology of ribosomes and enzymes boggles the mind. The migration of wintering birds or spawning fish is now pregnant with Gaian purpose. The structural engineering of trees or bones is entertaining. Leaves seem to make the most pleasing and economical solar panels. Life on Earth is gorgeous, and there is something behind it. Life on Earth belongs here. We all belong here. There is a legacy of purpose, intelligence, and intentionality behind our existence. Our hopes and dreams spring from something cosmic. We have descended from cosmic ancestors. They had a motive for launching us, the perpetuation of life. In the words of another cause, "I am somebody." Some of the beauty in nature, we must admit, is completely unnecessary for any survival purpose. Lots of tropical birds, fish, and flowers could easily be a little plainer without suffering. For whom is there so much beauty in nature? Maybe for us. Maybe peacock feathers were just thrown in to get our attention. Maybe unnecessary natural beauty is one of the trademarks of cosmic ancestors. Perhaps our morality is grounded in cosmic ancestry. Our cosmic ancestors would have had access to the gene or array of genes for altruism. They would have programmed altruism to activate as soon as possible, because they would have been concerned for the success of the whole enterprise. That way, the more highly organized forms of life wouldn't be at the mercy of chance, hoping for heroism and love to emerge out of nowhere. It's possible. What if our cosmic ancestors programmed us to play their favorite music? Not exactly the same tunes, of course. But, we, as cosmic ancestors, would apparently have a similar tendency. In 1977, NASA launched two Voyager satellites to explore the outer planets. After swinging by the orbit of Pluto in 1988 (Voyager 1), and 1990 (Voyager 2), the two craft will continue to coast indefinitely, to parts unknown. Both are carrying with them a little bit of the story of civilization on Earth (9). One of the things included in each interstellar message-in-a-bottle is a 90-minute selection of our favorite music, including Bach, Mozart, Chuck Berry, a Peruvian panpipe and drum piece, some Australian Aborigine songs, and a variety of other musical selections. The music is included with other earthly sounds on a 12-inch gold plated copper disk carried in a protective aluminum jacket and accompanied by a cartridge, needle, and "how to play" instructions in a symbolic language. What motivated us to do that? The religious tendency among us is persistent. Our religious traditions tell us that a god lives in the sky and made us in his image. Such beliefs are literally true, if we have cosmic ancestors. This doesn't mean that our cosmic ancestors are gods with supernatural powers. They would be mortal gods, with great, but not supernatural, powers. They would be gods such as we Earthlings might become, if we continue to evolve. Our cosmic ancestors would want us to know about them. We can be pretty sure of that by putting ourselves into their shoes. Perhaps they installed in our genes a genetic memory of themselves. Such a genetic memory could account for the persistence of religions around the world. And it would explain in a new way why the mythologies of different religions are so similar, as philospher Joseph Campbell tells us (10). Forelaws on Board by Robert Cobb, is a website that promotes "The Forelaws Principle". 20 Sep 2012: Neil DeGrasse Tyson endorses panspermia and discusses some of its implications. Scientists Sequence Genome Of Human Relative That Prefers Love Over War, The Ohio State University, 13 Jun 2012. 4 Apr 2007: How did life on Earth originate? Christopher Rose and Gregory Wright, "Inscribed matter as an energy-efficient means of communication with an extraterrestrial civilization" [abstract], doi:10.1038/nature02884, p 47-49 v 431, Nature, 2 Sep 2004. See also E.T., Don’t Phone Home; Drop a Line Instead, Rugers University, 1 Sep 2004; and a message to CA from Chris Rose, 23 June 2005. 17 Dec 2004: Genes for religion? — A new book makes this suggestion. Michael Balter, "Seeking the Key to Music" [summary], p 1120-1122 v 306, Science, 12 Nov 2004. Pioneering Altruism as a viable social norm, related website added 27 Sep 2003. 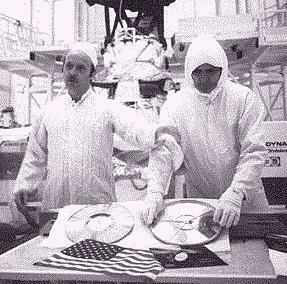 The Voyagers' Message in a Bottle re: the 12-inch interstellar record disk, Astronomy Picture of the Day, 31 Aug 2002. 2001, July 6: NAI comments on SETI. Is There a Music Gene? by Matt Crenson, The Associated Press, 17 July 2000. 1. Lynn Margulis and Dorion Sagan, What Is Life?, Simon and Schuster, 1995. p 52. 2. A. I. Oparin. "The Origin of Life," 1924; reprinted in Origins of Life: The Central Concepts, David W. Deamer and Gail R. Fleischaker, eds., p 31-71, Jones and Bartlett Publishers, 1994. p 39. 3. Christian de Duve, Vital Dust, BasicBooks, 1995. p 7. 3.5. "What went on?" is also recommended by Diane Nesin. 4. [quoted in] Connie Barlow, ed., Evolution Extended, The MIT Press, 1994. p 180-198. 5. Bertrand Russell, Why I Am Not a Christian and other essays on religion and related subjects, New York: Simon and Schuster, 1957. p 106. 6. Fred Hoyle, The Nature of the Universe, Harper and Row, Publishers, Inc., 1950. p 121. 7. Paul Feyerabend, Killing Time: The Autobiography of Paul Feyerabend, Chicago University Press, 1995. p 92. 8. Lewis Thomas, Late Night Thoughts on Listening to Mahler's Ninth Symphony [first published 1983], Toronto: Bantam Books edition, 1984. p 57. 9. Voyager Golden Record from JPL, NASA, describes Voyager's interstellar message. 10. Joseph Campbell, Creative Mythology, Viking Penguin, 1976.